JPost, BRUSSELS – The number of journalists who died in targeted killings, bomb attacks or shootings around the world rose to 118 in 2014 from 105 the year before, the International Federation of Journalists said on Tuesday. Another 17 died in accidents or natural disasters while on assignment, according to the Brussels-based IFJ, which says it is the world’s largest journalists’ organization. Pakistan was the most dangerous country for the media, with 14 journalists killed. Next was Syria, where 12 died. Nine killings each occurred in Afghanistan and the Palestinian territories, the federation said. Eight journalists each were killed in Iraq and Ukraine. Among those killed were American journalists James Foley and Steven Sotloff. Both were beheaded by Islamic State militants, who have seized parts of Syria and Iraq. Editor’s note: Viewing this on mobile? Click here for a larger version of the map. (CNN) — The worst-ever outbreak of Ebola virus is stretching the medical capacities of Guinea, Liberia and Sierra Leone — the three West African countries hit worst by the virus — and alarming leaders around the world. 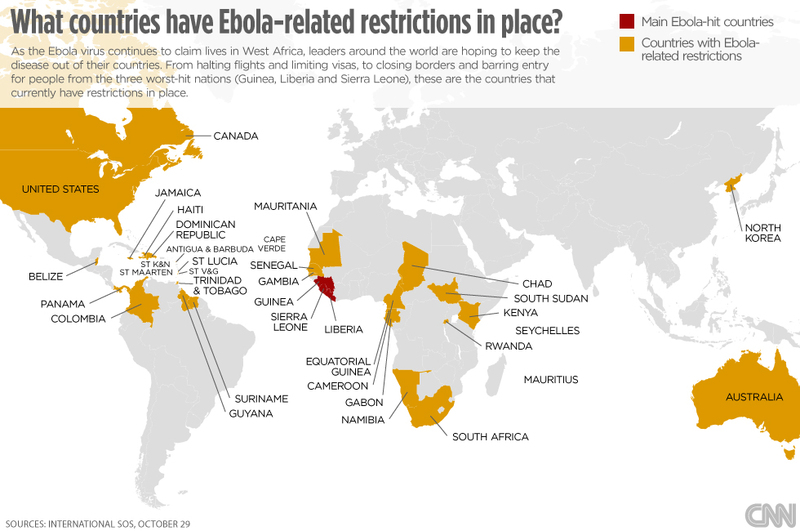 The following countries have restrictions in place aimed at keeping Ebola out, according to International SOS. Cancer is increasingly recognized as a major public health problem across Africa. The burden of the disease has worsened as rising living standards have led to lifestyle and environmental changes that increase the incidence of cancer, such as unhealthy diets, pollution and physical inactivity. A woman attending her stall at a market in Sierra Leone, one of the three countries worst-hit by the Ebola epidemic. 17 December 2014, Rome – The number of people facing food insecurity due to the Ebola epidemic in Guinea, Liberia, and Sierra Leone could top one million by March 2015 unless access to food is drastically improved and measures are put in place to safeguard crop and livestock production, two UN agencies warned today. The disease’s impact is potentially devastating in the three countries already coping with chronic food insecurity, the UN Food and Agriculture Organization (FAO) and the World Food Programme (WFP) said in three country reports published today. Border closures, quarantines, hunting bans and other restrictions are seriously hindering people’s access to food, threatening their livelihoods, disrupting food markets and processing chains, and exacerbating shortages stemming from crop losses in areas with the highest Ebola infection rates, the FAO-WFP reports stressed. In December 2014, half a million people are estimated to be severely food insecure in the three worst hit Western African countries. The loss of productivity and household income due to Ebola-related deaths and illness as well as people staying away from work, for fear of contagion, is compounding an economic slowdown in the three countries. In their reports, the Rome-based FAO and WFP underscore how the outbreak of Ebola has caused a significant shock to the food and agriculture sectors in the affected countries. In particular, labour shortages have marred farming operations such as planting and weeding while movement restrictions and fear of the disease have disrupted agricultural market chains. “The outbreak has revealed the vulnerability of current food production systems and value chains in the worst Ebola-affected countries,” said FAO Assistant Director-General and Regional Representative for Africa, Bukar Tijani. “FAO and partners need to act urgently to overcome the agriculture and market disruptions and their immediate impact on livelihoods which could result in a food security crisis. With timely support, we can prevent the outbreak from having a severe and long-lasting impact on rural communities,” he added. “The outbreak of Ebola in West Africa has been a wake-up call for the world,” said WFP Emergency Response Coordinator Denise Brown in Dakar. “The virus is having a terrible impact on the three worst-hit countries and will continue to affect many people’s access to food for the foreseeable future. While working with partners to make things better, we must be prepared for them to get worse,” she said. FAO and WFP call for urgent action to re-establish the farming system in the three countries. Measures should enable most severely affected people to access agricultural inputs, such as seeds and fertilizers, in time for the next planting season and adopt improved technology to address labour shortages. The reports also recommend cash transfers or vouchers for affected people to buy food as a way of overcoming their income loss and help stimulate markets. These efforts should go hand in hand with ongoing actions aimed at stopping the spread of the disease such as awareness-raising and related training. In Guinea, 230 000 people are estimated to be severely food insecure because of the impact of Ebola, and by March 2015, the number is expected to swell to more than 470 000. Aggregate food crop production in Guinea for 2014 is expected to be about three percent lower than in the previous year. In Liberia, 170 000 people are estimated to be severely food insecure because of the impact of Ebola, and by March 2015, the number is expected to swell to almost 300 000. The rapid growth in the spread of Ebola in Liberia coincided with the crop-growing and harvesting periods, and farm labour shortages have resulted in an estimated 8 percent decline in aggregate food crop production. In Sierra Leone, FAO-WFP estimates for November 2014 indicate that 120 000 people in Sierra Leone are severely food insecure due to the impact of Ebola. By March 2015, this number is expected to climb to 280 000. Aggregate food production is estimated to be 5 percent lower than 2013. However, rice production is expected to dip by as much as 17 per cent in one of the country’s most infected areas, Kailahun, which is usually one of the country’s most productive agricultural areas. FAO is providing assistance to 200 000 people in Guinea, Liberia and Sierra Leone. Crucial activities include community campaigns to help stop the spread of the disease, strengthening savings and loan schemes, particularly those involving women; and provision of in-kind or financial support to vulnerable households to safeguard livelihoods and incomes. WFP is focusing on meeting the basic food and nutrition needs of affected families and communities in the three worst-affected countries. So far, WFP has provided food assistance to more than two million people. WFP is also providing crucial transport and logistics support, particularly to medical partners, and is building Ebola treatments centres and storage hubs for humanitarian interventions. The scope of the crisis remains large in 2015, and both UN agencies urgently require more funding to continue to assist the most vulnerable communities whose lives and livelihoods are threatened by the disease. א וְאַתָּה בֵּית-לֶחֶם אֶפְרָתָה, צָעִיר לִהְיוֹת בְּאַלְפֵי יְהוּדָה–מִמְּךָ לִי יֵצֵא, לִהְיוֹת מוֹשֵׁל בְּיִשְׂרָאֵל; וּמוֹצָאֹתָיו מִקֶּדֶם, מִימֵי עוֹלָם. 1 But thou, Beth-lehem Ephrathah, which art little to be among the thousands of Judah, out of thee shall one come forth unto Me that is to be ruler in Israel; whose goings forth are from of old, from ancient days. ב לָכֵן יִתְּנֵם, עַד-עֵת יוֹלֵדָה יָלָדָה; וְיֶתֶר אֶחָיו, יְשׁוּבוּן עַל-בְּנֵי יִשְׂרָאֵל. 2 Therefore will He give them up, until the time that she who travaileth hath brought forth; then the residue of his brethren shall return with the children of Israel. ג וְעָמַד, וְרָעָה בְּעֹז יְהוָה–בִּגְאוֹן, שֵׁם יְהוָה אֱלֹהָיו; וְיָשָׁבוּ, כִּי-עַתָּה יִגְדַּל עַד-אַפְסֵי-אָרֶץ. 3 And he shall stand, and shall feed his flock in the strength of the LORD, in the majesty of the name of the LORD his God; and they shall abide, for then shall he be great unto the ends of the earth. ד וְהָיָה זֶה, שָׁלוֹם; אַשּׁוּר כִּי-יָבוֹא בְאַרְצֵנוּ, וְכִי יִדְרֹךְ בְּאַרְמְנוֹתֵינוּ, וַהֲקֵמֹנוּ עָלָיו שִׁבְעָה רֹעִים, וּשְׁמֹנָה נְסִיכֵי אָדָם. 4 And this shall be peace: when the Assyrian shall come into our land, and when he shall tread in our palaces, then shall we raise against him seven shepherds, and eight princes among men. ז וְהָיָה שְׁאֵרִית יַעֲקֹב בַּגּוֹיִם, בְּקֶרֶב עַמִּים רַבִּים, כְּאַרְיֵה בְּבַהֲמוֹת יַעַר, כִּכְפִיר בְּעֶדְרֵי-צֹאן–אֲשֶׁר אִם-עָבַר וְרָמַס וְטָרַף, וְאֵין מַצִּיל. 7 And the remnant of Jacob shall be among the nations, in the midst of many peoples, as a lion among the beasts of the forest, as a young lion among the flocks of sheep, who, if he go through, treadeth down and teareth in pieces, and there is none to deliver. ח תָּרֹם יָדְךָ, עַל-צָרֶיךָ; וְכָל-אֹיְבֶיךָ, יִכָּרֵתוּ. 8 Let Thy hand be lifted up above Thine adversaries, and let all Thine enemies be cut off. יב וְהִכְרַתִּי פְסִילֶיךָ וּמַצֵּבוֹתֶיךָ, מִקִּרְבֶּךָ; וְלֹא-תִשְׁתַּחֲוֶה עוֹד, לְמַעֲשֵׂה יָדֶיךָ. 12 And I will cut off thy graven images and thy pillars out of the midst of thee; and thou shalt no more worship the work of thy hands. יג וְנָתַשְׁתִּי אֲשֵׁירֶיךָ, מִקִּרְבֶּךָ; וְהִשְׁמַדְתִּי, עָרֶיךָ. 13 And I will pluck up thy Asherim out of the midst of thee; and I will destroy thine enemies. Is There A Place for Jesus in Your Home? God on high chose from among all the women of the world the virgin Mary filled with grace. The Holy Spirit came upon her, purified her and made her holy. She was made worthy for the Word of God to take up residence in her and to take from her a complete body. The apostle John described this saying . . . “In the beginning was the Word and the Word was with God and the Word was God . . . And the Word became flesh and lived among us and we have seen his glory, the glory as of a father’s only son, full of grace and truth” (John 1:1,14). The apostle Paul expressed this amazing matter saying: “Without any doubt, the mystery of our religion is great: He was revealed in the flesh.” (I Timothy 3:16). It is the miracle of miracles how the virgin Mary endured the greatness of the miracle of God’s incarnation that happened to her, with her and before her! She was just a simple girl whose age was not more than fourteen years! For she was a virgin before she gave birth, during birth and after birth. She was a mother while nursing with her pure milk her holy Son swaddled and laying in a manger. She gave birth to him in the stall of an inn in Bethlehem because there was no place for them in the inn! The day the angel brought her the good news of the holy pregnancy he said to her: “Do not be afraid, Mary, for you have found favor with God. And now, you will conceive in your womb and bear a son, and you will name him Jesus, He will be great, and he will be called the Son of the Most High, and the Lord God will give to him the throne of his ancestor David. He will reign over the house of Jacob forever, and of his kingdom there will be no end. Mary said to the angel, “How can this be, since I am a virgin?” The angel said to her, “The Holy Spirit will come upon you, and the power of the Most High will overshadow you; therefore the child to be born will be holy; he will be called the Son of God “ (Luke 1:30-35). So, where is the greatness of Jesus, oh angel Gabriel? Where is his kingdom? Where is his throne? Yes, his kingdom is not of this world. So, even though the priests and rulers of this earth ignored his existence, the heavens gave him glory and the angel brought the good news of his birth to the simple shepherds saying to them, “‘Do not be afraid; for see—I am bringing you good news of great joy for all the people: to you is born this day in the city of David a Savior, who is the Messiah, the Lord. This will be a sign for you: you will find a child wrapped in bands of cloth and lying in a manger.’ And, suddenly there was with the angel a multitude of the heavenly host, praising God and saying, ‘Glory to God in the highest heaven, and on earth peace among those whom he favors!’” (Luke 2:10-14). When the shepherds went quickly to the place where the king messiah was born, they found him but also found that his kingdom was an animal stall and his throne a manger. So, they worshiped him and they returned telling the good news of his birth. Thus, they were the first to receive the good news and the first to preach the good news of the Savior Messiah. But the chief priests, the scribes, and pharisees and others who were entrusted with keeping the prophets did not know at the time what they missed, even when the Magi came from the east to Jerusalem and asked about the one born the king of the Jews. King Herod inquired of the chief priests about the Messiah’s place of birth. The priests told him that the prophet Micah had prophesied that the Messiah would be born in Bethlehem Ephrata, but they did not trouble themselves to research it. So, it was fulfilled in them what the prophet Isaiah had prophesied about them eight centuries before the birth saying, “The ox knows its owner, and the donkey its master’s crib” (Isaiah 1:2-5). Therefore, it is not surprising that when the virgin Mary and her fiance did not find a place in the inn they took refuge in the stall of an ox and a donkey to give birth to the Messiah. There his mother wrapped and laid him in a manger. Because of his birth the manger was changed into a holy place and became a focus of attention for all Christians so to him the kings of the earth and its great leaders would come and take off their crowns, bow their heads and even worship the one born in a manger. Yes, the manger was a suitable place for the child Jesus the Savior to be placed who on the contrary came down from heaven to teach humility. His humility would be a beneficial medicine for the healing of humanity from the illness of pride and submitting even to death, the death of the cross, to take away the shame of the disobedience of humanity against the commands of their Lord in paradise: “For God so loved the world that he gave his only son, so that everyone who believes in him may not perish but may have eternal life” (John 3:16). So, the manger was the suitable place for the one who came to serve and not to be served, to sacrifice himself for the redemption of many. He began his divine economy of salvation in the body laid in a simple manger which became on the other side of his life the cross of shame he carried on his shoulder before the malicious crowd shouting “Crucify him! Crucify him!” He hence would be hung on it and, furthermore, after his death in the flesh he would be laid in a new tomb he did not own. Did he own any worldly possessions? He is the one the scribes asked saying “‘Teacher, I will follow you wherever you go.’ And Jesus said to him, ‘Foxes have holes, and the birds of the air have nests; but the Son of Man has nowhere to lay his head’” (Matthew 8:19, 20). Yes, the believer who contemplates the events of the birth of the redeemer would give glory to God on high for His holy plan and the delivery of godly truth to the minds of humanity. The prophesies that had been announced on the tongues of the true prophets had been fulfilled to the letter. Yes, the wisdom of God in managing the universe cannot be grasped by the mind of humanity. The virgin Mary was in Nazareth in the house of her fiance Joseph where the angel Gabriel had told her the good news of her divine pregnancy. When the end of her days of pregnancy came near she was about to give birth to her oldest son, though if she had been given the choice she would have stayed in the house of her fiance Joseph in Nazareth. But, God had ordained from the beginning that the Savior would be born in Bethlehem of Ephrata and the godly inspiration that announced this was on the tongue of the prophet Micah in the 8th century before the birth (Micah 5:2). That his birth was in Bethlehem the city of David assures us that He is from the descendants of David. That Jesus Christ the Savior had been registered on the registry of the tax rolls of the Roman Empire is an irrefutable proof that he had truly come in the flesh from the line of David. Lordly desires enticed Caesar Augustus to issue a decree that the whole inhabited world should be registered, he meant by the whole world those people under control of the Roman nation. God on high ordained that Caesar Augustus’ order would be to register the Jews according to their custom that every one would go to the city of his ancestors to be registered there so as not to make confusion of the descendants and origins. Yes, the believer will always be amazed and surprised when he reads the story of the birth of the Redeemer for the simplicity of its expression and the easiness of the way of writing so even a child would understand it’s sentences in detail. While at the same time great philosophers are not able to fathom the depth of its meaning and understand its divine secrets. This is what the Lord Jesus meant in his prayer to his Father in the saying about the divine administration in the flesh. “I praise you Father, Lord of heaven and earth, because you have hidden these things from the wise and the intelligent and have revealed it to infants.” (Matthew 11:25). God has hidden his secrets from those who are wise in their own eyes to put to shame the wisdom of this world. Therefore Jesus didn’t have a place in their houses and was not born of a daughter of the rich or of the great philosophers or scientists, but he was born of a poor, orphan, virgin girl, Mary. Yet she was from the lineage of kings and priests and prophets. He was not lain on a bed made of gold and ivory, neither was his pure body wrapped in soft silk. Rather, he was swaddled in linen and placed in a manger in the stall of an inn in Bethlehem, a humble city, but everyone who would look for him would find him. He came for all humanity, especially for those who toil, those who are tired and those who are oppressed. I imagine him now, when he was a small child laying in a manger having spread his arms calling people to him as he called them later saying “Come to me, all you who are weary and are carrying heavy burdens, and I will give you rest. Take my yoke upon you, and learn from me; for I am gentle and humble in heart, and you will find rest for your souls. For my yoke is easy, and my burden is light” (Matthew 11: 28-30). This is his practical, heavenly message: that we learn meekness and humility from him to lift from our shoulders the heaviness of arrogance, snobbery and pride so we find peace with God and ourselves and with all people; that we learn from him the love made visible in the holy cross that he calls his simple yoke and light burden. He has ordered us to carry it every day and to follow him on the path of Golgotha, the way of suffering, the way of sacrifice and self denial. The manger is the beginning of the way to the cross. The cross is love in two dimensions. The first dimension is the vertical that points toward heaven drawing love from God who first loved us so that we love him from all of our heart, all of our mind and all of our will. The second dimension is the horizontal, which cuts the vertical dimension. Here our love of God is reflected unto all people so we can work by the commandment of God through loving them and sacrificing to lighten their pain in that manner following the Good Samaritan. For he aided the one who fell among the thieves in the parable that the Lord Jesus gave us as an example to teach us mercy that is the fruit of love. The message of Christmas is the message of love. The child Jesus was born on this very day in a cattle pen and wrapped and laid in a manger because there was no room for him in the inn. We see him today in millions of children who have no place of refuge, who with their mothers and fathers are starving while we are satiated in the luxury of many good things and appear like the rich man in the parable of the rich Lazarus that the Lord Jesus gave us as an example. The rich man did not show concern for the poor Lazarus who was cast in front of the door of his house and was dying of hunger. Both died and the rich man was taken to hell but the angels carried Lazarus’ spirit to the lap of Abraham. So, all those in need, all the poor and all the needy orphans and poor widows are the little brothers of Jesus. Moreover, they represent the poor child Jesus who did not have a place in the inn so he was lain in the manger of an inn’s barn in Bethlehem of Ephrata. So why don’t we adopt the teachings of the Lord Jesus who will judge humanity on the last day on the basis of the good deeds they did along side of their faith in Him. Why don’t we yearn to stand on his right side with those who will hear His beautiful voice saying to them, “‘Come, you that are blessed by my Father, inherit the kingdom prepared for you from the foundation of the world; for I was hungry and you gave me food, I was thirsty and you gave me something to drink I was a stranger and you welcomed me I was naked and you gave me clothing, I was sick and you took care of me, I was in prison and you visited me…’Truly I tell you, just as you did it to one of the least of these who are members of my family you did it to me’” (Matthew 25:34-40). Today while we are celebrating the occasion of the birth of the Lord Jesus. I wonder if we have prepared a place for him to be born in our hearts. Have we told our children about his amazing birth in the flesh? Have we told them about his mother the poor, orphaned, virgin Mary, descendent of kings and priests and prophets and the pure saint who said about herself: “from now on all generations will call me blessed for the Almighty has done great things for me?” Have we told them about her: How she was pondering in her heart all of the words that she heard from heaven and from the sons of the earth, and how she was devoted to the law of the Lord day and night? Or, have we changed the feast of the Birth into a worldly affair that is not connected to the feast spiritually? Have we told them about the love of God for us and his sending his only Son for our salvation and the placing of the Son in the manger in a barn to teach us humility and meekness because he did not have a place in the inn? Does he have a place in our homes and our hearts? Or, are our hearts full of love for things other than God as were the hearts of the scribes and the pharisees and the priests of the Jews who ignored the prophets and were preoccupied with worldly affairs? I wonder if, as we are celebrating our religious liturgies on this happy occasion, we feel that Christ is with us and among us sharing with us the joy of the feast; or are we strangers to him and he is far from us? He was called Emmanuel, which means God with us (Matt. 1:23) and his name was called Jesus because he saves his people from their sins (Matthew 1:21). Have we accepted him as our savior and believed in the mystery of the incarnation and redemption? Or do we celebrate this liturgy of his feast as a routine duty that has the appearance of piety but has lost its power? Have the spiritual traditions become converted into mere social customs that are not connected to the Spirit. Do we take advantage of the opportunity of the holiday to spend them enjoying illicit physical pleasures through intoxication, noisy contentiousness, adultery and gambling? These distance Christ from us and distance us from Christ, for he then has no place in our homes and our hearts, and he will not be with us on these occasions because they are far from the spirit of piety, the fear of God, meekness and humility. Let us prepare a place for Christ in our homes, our hearts and our souls so that it is not we who live but Christ in us (Galatians 2:20). Let us emulate the virgin who kept in her heart what she had heard from the angels, the Magi, and the shepherds and what she had seen of the dazzling miracles and the good news that she had been told. Let’s heed the saying of the Lord Jesus while he was answering the woman who raised her voice from among the crowd and said to him, “‘Blessed is the womb that bore you and the breasts that nursed you.’ But he said,‘Blessed rather are those who hear the word of God and obey it!’” (Luke 11:27,28). Let us listen to the Word of God, memorize it and do it to deserve the blessing that the virgin Mary had gotten in giving birth to the Lord Christ in the flesh. May this feast be a blessing to you. Amen. There is no immediate threat to homes in the area, Hawaii County’s website said, but officials will keep residents updated on the possibility of evacuations. They’re also asking drivers to be extra cautious in the area. The lava flow began its 13-mile trek from Kilauea on June 27. A separate flow front came within feet of the main road in Pahoa before stalling out in October. After that, a new flow front began moving toward the northern edge of the town and has become the latest threat, SF Gate reports. Pahoa is a small mountain town with fewer than 1,000 residents, according to USA Today. Suomalaista jännittää jos laava tulee jyräämään hänen mökkinsä kylän Pahoan.. Nyt laava on mailin parin päässä. valumassa alaspäin. The Finnish man has his cottage half a km from the lava frontier today. Information about Kilauea Volcano, Hawaii. Laze is a hydrochloric acid mist formed by the action of lava on seawater. Extreme heat from lava entering the sea rapidly boils and vaporizes seawater, leading to a series of chemical reactions. The boiling and reactions produce a large white plume, locally known as lava haze or laze, which contains a mixture of hydrochloric acid (HCl) and concentrated seawater. Sulphur dioxide gas and other pollutants emitted from volcanoes react with oxygen and moisture to produce volcanic smog (vog) and acid rain. Vog creates a health hazard by agrivating pre-existing respiratory ailments. When lava meets the sea, large steam plumes ( “laze”- lava haze) are created as the more than 1100°C (2012 °F) lava boils and vaporizes seawater. A portion of this steam recondenses and rains out of the plume as acidic precipitation that has been enriched with seawater salt, and contains tiny glass fragments generated by the intense physical interaction of hot lava and cool seawater. laced with tiny glass shards. Even if moisture is not felt downwind of the ocean entry, a non-condensing plume still contains hydrochloric and other acid gases. Inhaling or contacting acid gases and liquids can irritate the skin, eyes and respiratory tract and may cause breathing difficulties, particularly to those with pre-existing respiratory problems.